Does Sound Affect The Way We Behave In Restaurants? Restaurants have become noisier over the past several decades, that’s not just an anecdotal observation, it is a fact. Is this trend simply due to overzealous chefs and restaurant managers, or is there a more scientific reason why our favorite place to dine has turned up the volume of their music? In this article we’re going to explore scientific studies that shed light on how sound, particularly the sound of music, impacts how we eat and drink. The problem of increasing volume levels of music in popular restaurants can be traced back to the mid-1990s, in particular, when chef Mario Batali decided for the first time that it would be a good idea to play the same tunes he and his colleagues listened to (Led Zeppelin, the Who, the Pixies, etc…) in his Babbo restaurant. Subsequently, other chefs, such as David Chang, followed Batali’s footsteps; and the result has been louder music in restaurants operated by top chefs. That said, it is important to remember that the level of noise in a public space like a restaurant doesn’t only depend on the amount of sound generated by those occupying the space and music playing in the background, but also on the sound-reflecting properties of the various surfaces and furniture in the restaurant. Some authors have suggested that the Scandinavian-industrial touch, which has become so popular in many restaurants and bars in recent years, is partly responsible. Both laboratory research and field studies come to the conclusion that people drink more when exposed to noisy music. Participants in a McCarron and Tierney lab study drank more soft drinks and faster, while listening to 88dB pop music compared to another group that listened to similar pop music at a 72dB level. 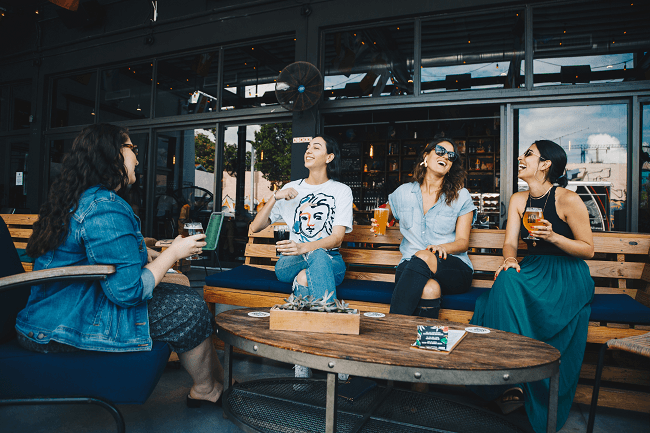 Meanwhile, Gueguen and co-workers conducted a study in a couple of bars in France, one located in a rural area and the other in an urban environment. The volume of normally broadcasted pop music varied. The 120 participants whose behavior was analyzed ordered significantly more drinks when the music was transmitted at 88dB – 91dB, compared to when the music was played at a lower volume in the 72-75dB range. Both of these scientific studies appear to show a direct link between loud noise and greater profitability for bars and restaurants – especially if that loud noise is pop music played at 88dB or higher. Beyond driving a need to drink more, other studies have show that people may eat more as the ambient noise level increases. It is worth noting that we are not the only species to show noise-induced behavior, laboratory mice have been shown to eat and drink more as the background noise increases as well. Kupferman, who conducted this study, states that the increase in food and drink (which was sometimes observed when the animals were already on a full stomach) can be explained in terms of a response to stress. The idea is that food acts as a distraction to keep animals from focusing on the stress caused by the noise transmitted at 80dB. An article in the Washington Post back in May of this year discussed a study which uncovered yet another way music impacts our eating habits. The article, “Loud music at restaurants could be leading you to order burgers over salads, study says“, discusses a 2016 study conducted in Stockholm by University of South Florida Marketing professor Dipayan Biswas which found that when music was played at higher volume (around 70dB) patrons were more likely to order food that was unhealthy for them with a 20% increase in orders of unhealthy foods. There’s also the results of a 4-year study by the Karolinska Institute in Sweden have found that for every 10 dB increase in road traffic noise levels, there was a 3 cm increase in waist size. Even more dramatically, those who were exposed to aircraft noise had a waistline, on average, wider than 6 cm. Showing it’s not only loud music, but possibly even loud noise in general that impacts our eating habits. All of this points to scientifically and profit-based reasons as to why restaurants are getting louder and louder in search of increasing revenue and profits. However, according to a 2016 survey by Consumer Reports, restaurant customers don’t like loud or excessive noise in restaurants. In this survey the number 1 complaint from customers across 25 different restaurant chains was “Excessive Noise Levels” beating out “Poor Service” by 4 points and “Dirty Environment” by 9 points. 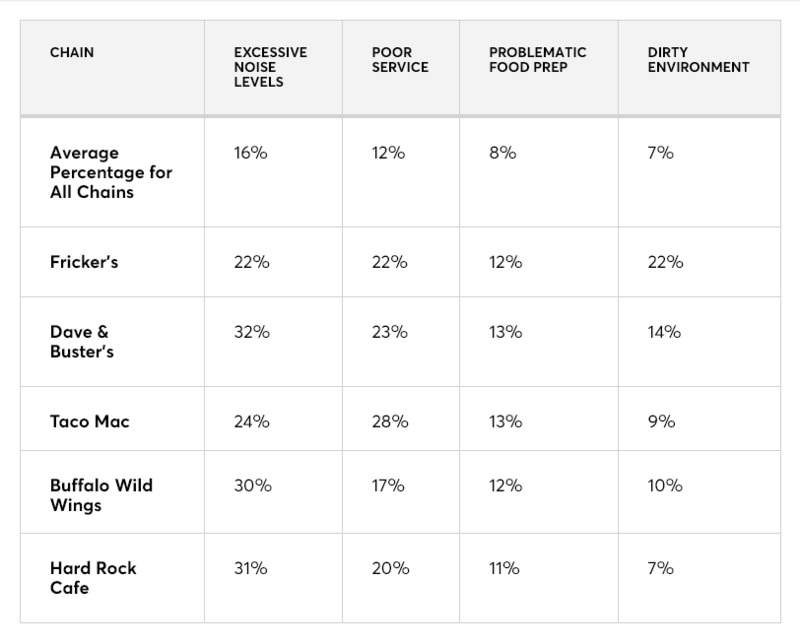 Some of the worst offenders in their survey were well-known restaurant brands like Dave & Buster’s, Buffalo Wild Wings, and Hard Rock Cafe. A 2018 Zagat survey showed similar results with 24% of people complaining about “Noise” in restaurants vs. just 12% complaining about the “Price”. A third survey done in 2016 by Action on Hearing Loss, a UK based non-profit, also found the same results – loud noise in a restaurant is annoying. This study of 1,461 people found that 91% said they would not go back to a restaurant where the noise level was too high, 79% said they’ve left a place early because it was too noisey, and 75% said they were likely to go out more often if the noise levels were quieter. Some of the restaurant chains in the 2016 consumer reports restaurant survey with their corresponding results. Yes, the type of sound and the volume of it does appear to directly impact how humans dine and drink while out at a restaurant. While this appears to drive increased table turnover rate, greater consumption, and more profits survey results show that making a restaurant quieter might make customers happier and drive repeat business along with good online reviews.